John Hus Moravian Church is a Brooklyn, New York, based congregation affiliated to the World-wide Moravian Unity through the Northern Province of the United States of America. 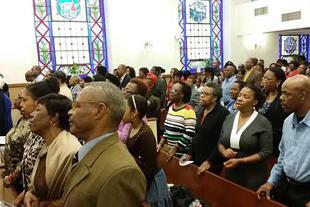 We are situated in the heart of Brooklyn and make every effort to minister to the hearts of our people. Our congregation started in 1966 with a clear goal of making Jesus known. From our early beginnings at Franklin Avenue to our present home, we have focused on a worship experience that is uplifting and a fellowship that is warm and receptive. Although we are a traditional church in the sense of origin, our worship services have evolved to incorporate elements of contemporary worship while preserving those essential elements of our customs and traditions. Each service is planned with the expressed intention of bringing joy to each person present while providing an atmosphere and context for serious reflection and introspection. The ultimate prayer is that all will be saved and therefore we are doing our part in our corner, by the grace of God, to facilitate this process. It is for that reason that we are inviting you to become a part of the John Hus Family. There are activities for each age group which attempt to address the special needs typical of our stages of development. Our facilities are modern and are consistently being improved. The Sanctuary and Fellowship Hall are accessible to the physically challenged, and we have all the literature and basic items that you will need for worship. Come as you are. There is a place for you and your family at John Hus Moravian. Our Doors, Hearts and Arms are always wide open. Our Mission Statement: To build up the body of Christ by making disciples through worship, study, nurture and fellowship; to develop the use of each member's talents and spiritual gifts, and to foster an atmosphere of encouragement and caring concern for the uncommitted through service to the wider community.